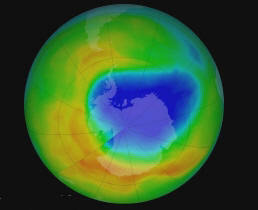 October 28, 2012 - The average area covered by the Antarctic ozone hole this year was the second smallest in the last 20 years, according to data from NASA and National Oceanic and Atmospheric Administration (NOAA) satellites. Scientists attribute the change to warmer temperatures in the Antarctic lower stratosphere. In addition to observing the annual formation and extent of the ozone hole, scientists hope OMPS will help them better understand ozone destruction in the middle and upper stratosphere with its Nadir Profiler. Ozone variations in the lower stratosphere will be measured with its Limb Profiler. "OMPS Limb looks sideways, and it can measure ozone as a function of height," said Pawan K. Bhartia, a NASA atmospheric physicist and OMPS Limb instrument lead. "This OMPS instrument allows us to more closely see the vertical development of Antarctic ozone depletion in the lower stratosphere where the ozone hole occurs."